When looking for a North Myrtle Beach vacation condo you will not have to look far to find an oceanfront vacation resort that offers comfort and relaxation for you and your family. At Sea Winds in North Myrtle Beach, South Carolina you will find vacation condos with enough room for six, seven or eight people. These two- or three- or even four-bedroom North Myrtle Beach vacation condos have incredible views of the Atlantic Ocean, an on-site swimming pool and private balconies. Sea Winds is located at 4719 Ocean Boulevard in North Myrtle Beach, South Carolina. This North Myrtle Beach resort is located on the Atlantic Ocean, only a few steps away from a day at the beach with your family. Sea Winds is in the Windy Hill section of North Myrtle Beach. When you stay at this North Myrtle Beach condominium you will only be minutes away from fishing piers, shopping, golf, dining and lots of family adventures. Highway 17 is only a few blocks from Sea Winds North Myrtle Beach resort. Highway 17 is the main road that will take you through the Myrtle Beach area during your search for memorable North Myrtle Beach vacation adventures. While staying at Sea Winds in North Myrtle Beach you will not have to worry about parking. There are two open parking lots with plenty of room for you to find a spot near your North Myrtle Beach condo rental. There is also covered parking available at Sea Winds. You will feel comfortable parking your car in either parking lot offered at this North Myrtle Beach resort. 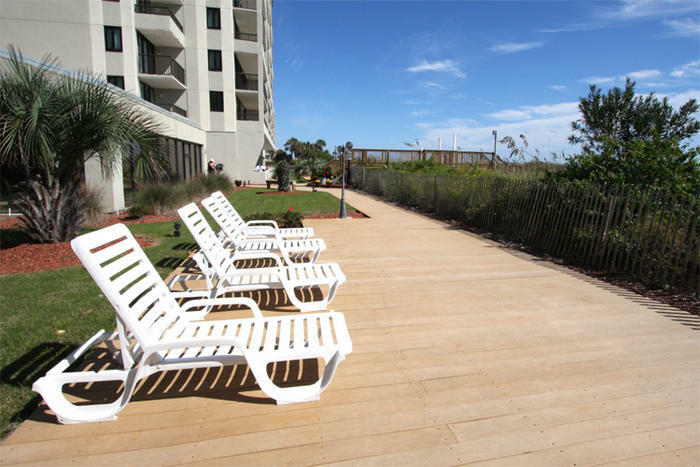 After parking your car you can easily access your North Myrtle Beach vacation condo by going up a flight of stairs or riding in one of two elevators that are on the Sea Winds property. One of the best parts of your North Myrtle Beach vacation at Sea Winds condo rentals will be having access to a sparkling blue swimming pool that is located inside the Sea Winds resort. On the first floor of this North Myrtle Beach resort is an indoor swimming pool that you and your family will enjoy. While swimming indoors you can still enjoy plenty of South Carolina sunlight. There are floor to ceiling windows that look out over the Atlantic Ocean. On a day when you need a little relaxation out of the sun you can still enjoy its beauty by relaxing in a lounge chair or in the sparkling water in the indoor pool at this North Myrtle Beach resort. Elliott Beach Rentals is not affiliated with onsite management or the HOA of Sea Winds.